It is true, my very first post in the rain. I have always wanted to take photos with a transparent umbrella. Well, the truth is that I am not satisfied with the quality of the photos but trust me it was so hard to do it, it was raining really strong (my bf is still angry about this photoshoot). After searching for half an hour, I picked those shots and hope you like them. Eventually today the rain stopped and the sun shined at last. I am a little bit sick those days but today I felt better hope until weekend I'll be perfect to waste all my time outside, shooting and stuff. Please be satisfy with the pictures - they are really cool and your look also! Very nice photos! I want an umbrella like this too! Just found your blog and I'm glad I did. I really like your style! I'm now following you through GFC, Bloglovin, Lookbook, and Facebook. I love this umbrella!!!!! Beautiful boots! Lady in the rain! Actually you are brave and the pic are not bad :) I also have the same problem often! Nice look. Love your shorts! I love this look and great pics! Kisses. I hate that it has started raining again but an umbrella is a perfect accessory. Nice combination and I like your scarf! awesome outfit! Im loving how perfectly you layered everything, super stylish yet still nice and warm for what looks like a super wet day! First of all thank you for following me on bloglovin' !!! I also saw your blog and i have to say that i like your outfits and your style very much and i am happy that you are a greek fashion blogger!!!! 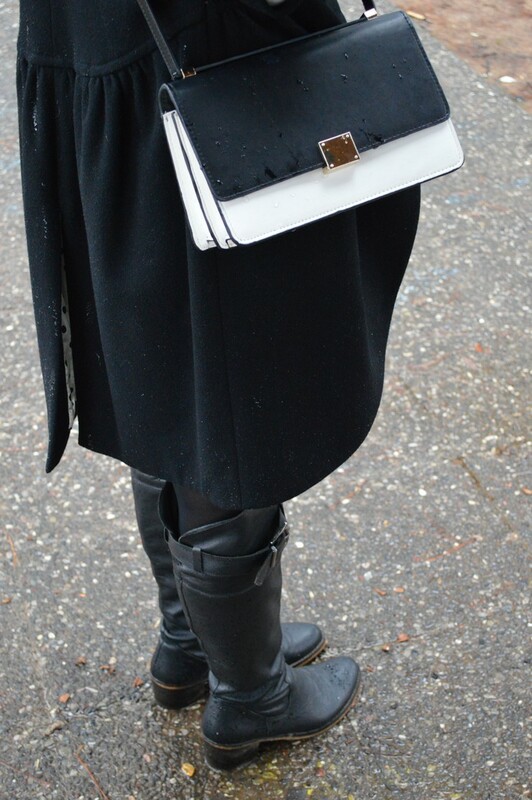 Your black & white bag is so classy, i love it!!!! love transparent umbrellas!♥ I just ordered one too and I canť wait to wear it! :) beautiful look!